This is a very sunny, bright apartment (970 Square feet - 90sq mt) with two bedrooms, two bathrooms (one en-suite) located on the top floor (fifth) of a typical roman mansion block with elevator access, it has been elegantly decorated and meticulously maintained. The apartment features upgraded insulated and sound-proofing windows, hardwood floors, air-conditioningin both bedrooms and Living room, with modern bathrooms and fully fitted kitchen. Accommodation consists of Living Room with dining area, flat screen TV, DVD player and Satellite Sky Decoder which will allow you to watch several of the channels in English. There is a laptop and free high speed internet connection and Wi-Fi. The Master bedroom has a flat screen TV / DVD player which can play region 1 dvd's and an en-suite shower room with WC and sink, the other fully fitted bathroom is next to the other double bedroom. The kitchen has an oven, microwave oven, gas hob, kettle, washing machine,dishwasher & Nespresso coffee maker. The apartment also benefits from independent central heating and continuos hot water. The apartment is just a few steps from the Vatican Museums and the Basilica of St. Peter. The Metro Ottaviano- SanPietro (Line A) is 200 meters away (218 yards), with direct line to Piazza di Spagna (Spanish Steps) , Piazza del Popolo, and Termini Railway Station and other turist destinations. The area is full of restaurants , trattorias , pizzerias, and 5 minutes walk from the apartment there is a local market ' Mercato Trionfale ' where you can shop for fresh bread, pasta, sausage, meats, produce and wine every day. This is an unoccupied apartment which means that it is kept strictly for Guest Rental, so only your belongings will fill the closets, drawers, tabletop, cabinets and refrigerator. Please note the building has a lift however there are still 10 steps to walk up to get to the front door of the apartment, if any in your party has mobility problems this property might not be suitable. Payment and cancellation policies are stated in the terms and conditions. Please note complimentary check-in is between 15:00 and 20:00 by appointment and check-out is by 10:00 on the day of departure. Guests arriving after 20:00 will be charged a supplementary check-in fee between 25,00€ and 50,00€. The city tax of 3,50€ per guest per night will be assessed and paid separately in cash at check-in. This apartment is smoke and pet free. Keywords: Apartment, St. Peters, Vatican, Museums, air conditioning, top floor, full of light, walking distance to restaurants and shops, fully furnished, beautifully decorated, very clean, stylish, comfortable, fully fitted kitchen, Nespresso coffee maker, metro and bus links , satellite TV with English speaking channels,free access to high-speed Internet, free wi-fi, laptop available. I am the owner of the Property and as I live in London I use a Property Management Company based in Rome , run by Cory, who is an American but has lived in Rome for a number of years. Cory and his team look after the apartment for me. Once you have made the payment via VRBO/HomeAway the Property Management Company will manage your reservation as well as assist you during your stay. They will be your primary contact and will be happy to answer any questions you have regarding you stay. Being an Interior Designer I have great attention to details therefore in decorating and furnishing the apartment I tried to think of everything someone would want as my aim is to make my guests feel comfortable and at home in this beautiful city. View more about The owner. Free Wi-Fi throughout the apartment & Fibre High speed Internet together with a laptop for you to use. The building has a lift however there are still 10 steps to walk up to get to the front door of the apartment, if any in your party has mobility problems this property might not be suitable. Acoustic isolation windows have been fitted in March 2017 on windows overlooking the main road. Air conditioning available in both bedrooms and in Living Room . We are a family of 4 and stayed 3 nights. The management company, Home in Rome, was excellent. They helped on arrival find a location nearby to store our luggage and did a thorough walk thru of the apartment and neighborhood upon arrival, very professional. The apartment was perfect for our needs with the bedrooms, kitchen, rollout sofa and study nicely laid out for privacy. The beds were very comfortable and we enjoyed the Nespresso machine daily. Location was great, one block from the metro and quick walk to the Vatican. All in all a great experience! 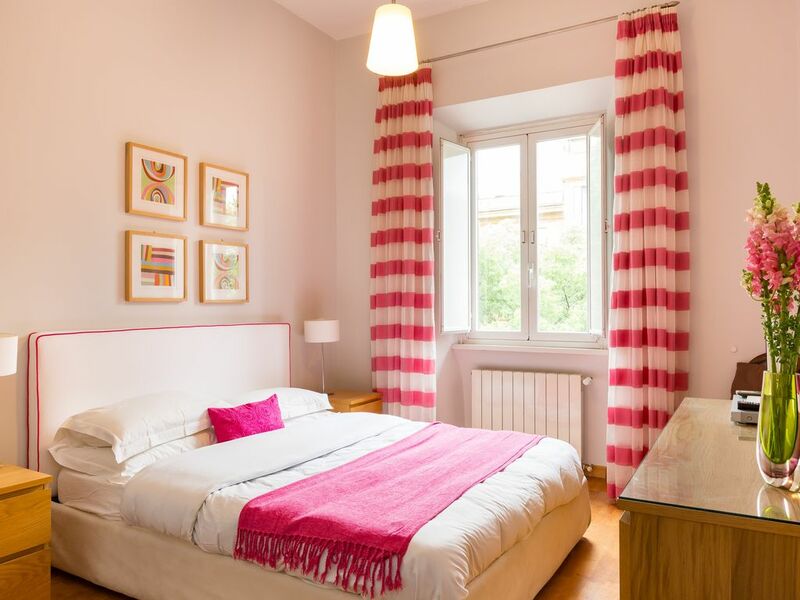 We were blown-away by this beautiful, spacious apartment, so well situated for our holiday in Rome. The location was just right - away from the busy tourist centre, but just a short walk from the Metro and an easy stroll down to St Peters and the Vatican. We found plenty of small friendly places to eat nearby and a supermarket around the corner for a few essentials. The place had all of the facilities we needed; air conditioning (we found to be important in a Roman summer! ), dishwasher, washing machine, etc. Beds were large and comfortable and the whole place decorated with style. We loved it; and Rome is now our favourite world city! The apartment was lovely and so well equipped- right down to clothespins to hang out wash! After four visits to Rome, staying in hotels, we wanted to live like the locals and this unit was perfect. Four adults were very comfortable with even an office area complete with laptop. Flavia made us feel like welcomed guests. We are Americans with very high expectations and we were thrilled. This will now be our home away from home every time we visit Rome. An extremely comfortable,spacious,very well equipped and maintained apartment exactly as described and photographed for the website, with a high standard of fittings and furnishings. Ottaviano metro station is conveniently close by and the Vatican is within easy walking distance. There is a good choice of restaurant in the local area, plus an excellent covered market if you prefer to eat in. We were particularly impressed with our dealings with the owner who went to great lengths to ensure that our stay in her apartment was as enjoyable and relaxing as possible. All our (many) queries, both before and during our stay were dealt with promptly and professionally; in addition a delivery of groceries was arranged so that we were able to eat in on the evening of our arrival. RomeCabs provided an efficient transfer service to Ciampino. This is the second time we have used HomeAway and feel that direct contact with the owner is far preferable to dealing with a letting agency. This was much more than a holiday let and felt like a real home.We would be happy to return and would recommend this apartment unreservedly. Many thanks to the owner for ensuring that we had a great holiday. The apartment was clean and very well equipped. Everything worked as described and we were provided with excellent information prior to our stay which ensured everything ran smoothly. The air conditioning was very efficient - a bonus as it was quite hot during our stay. The whole booking process was great - Flavia was very prompt acknowledging all emails and refunding the damage deposit. Overall, no complaints and I wouldn't hesitate to recommend the apartment (as long as you are reasonably fit until the elevator is installed!). Apartment, St. Peters, Vatican, Museums, air conditioning, top floor, full of light , walking distance to restaurants and shops, fully furnished, beautifully decorated, very clean, stylish, comfortable, fully fitted kitchen, Nespresso coffee maker, metro and bus links , satellite TV with English speaking channels, free access to high-speed Internet, free wi-fi, laptop available. Rome City Tax of €3.50 per person per day is not included in the rates. This is payable in cash on day of your arrival. 50% Deposit required at time of booking. The balance is due 30 days before arrival.